The Milwaukee County Zoo is excited to announce the addition of two African lions, Savannah and Amali, from the Seneca Park Zoo in Rochester, NY as part of a recommendation from the Association of Zoos and Aquariums Species Survival Plan®. Savannah, nicknamed “Sunny,” was born at Seneca Park Zoo in 2013. She may receive a future breeding recommendation with Themba, the Zoo’s male African lion. Amali was born at the Wildlife Conservation Society’s Bronx Zoo in March 2013 and had resided at Seneca Park Zoo since July 2013. The two female lionesses are settling into their new surroundings quite nicely. They are cooperating with their new zookeepers, shifting and approaching for food when appropriate. Big Cat Supervisor Katie Kuhn says that they are “definitely young spunky lionesses, but they are very good girls.” They have even begun to practice simple behaviors with the zookeepers like target training. So far, the new lionesses have not had any contact with Themba and Sanura, the veteran pair of lions at the Zoo. Although they can see and hear each other through a hallway, and both groups know the other is there, they will not have access to each other for the foreseeable future. According to their zookeepers, Sunny and Amali get along with each other very well. Sunny seems to be in charge, but Amali will investigate new situations first. Sunny can often be shy and reserved, while Amali is full of personality. 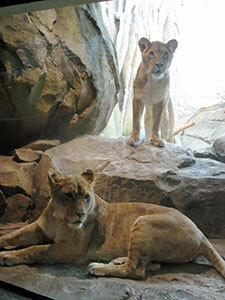 Sunny and Amali can be seen periodically on indoor exhibit in the Florence Mila Borchert Big Cat Country.